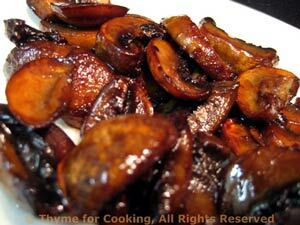 Sautéed Mushrooms, Thyme for Cooking simple sides. Heat butter, oil and Worcestershire in medium nonstick skillet over medium heat. Add mushrooms and sauté, stirring frequently, until they are dark and glazed, about 10 minutes. You may have to turn the heat down a bit after 7 or 8 minutes. Set aside and partially cover to keep warm... Or start to nibble..